To celebrate Fine Cooking’s 25th anniversary, we figured a signature cocktail was in order. This little beauty is sure to get any party started. 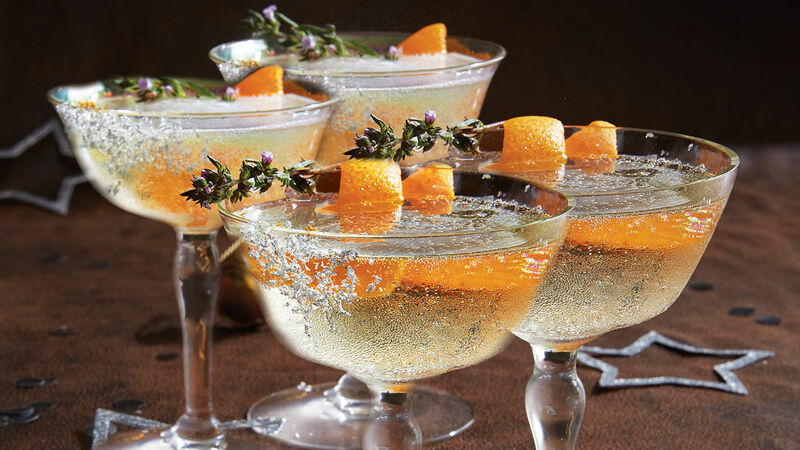 Bubbly Champagne, floral gin, and the complex nutty sweetness of maraschino liqueur elevate this drink to the pantheon of cocktails. It certainly has been a fine 25. In a cocktail shaker filled with ice, shake the gin and liqueur. Rub the orange peel along the rim and/or sides of a coupe glass. Pour the silver-leaf powder onto a saucer, and upend the glass onto the saucer to coat the rim and/or sides of the glass. Drop the orange peel into the glass. Strain the cocktail into the glass, and top with Champagne. Decorate with thyme sprigs, if you like. Serve immediately.